Meet your group and Tour Manager at the Le Parker Meridien in New York today. Today we take a guided tour of the 'Big Apple', including Central Park, an open, leafy space set amongst the city's skyscrapers. Later we enjoy a cruise around Manhattan Harbor, spotting landmarks from our unique vantage point on the water including Ellis Island and the torch-wielding icon, the Statue of Liberty. 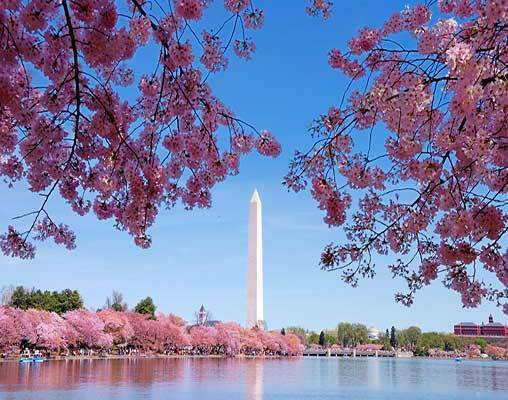 On Day 3 you take the train south to Washington, the nation's capital, where you spend two nights at the Fairfax Embassy Row, located in the Dupont Circle district of the city. This afternoon you begin a guided tour of this elegant city, passing many of the famous landmarks including the White House, Capitol Hill, historic Georgetown and the Pentagon. Day 4 is free to explore Washington at leisure. Why not visit the world's largest art, science and history museum complex - the fantastic Smithsonian? There are many other terrific places to visit, including Arlington Cemetery and lively Adams Morgan and many other sights. We leave Washington late-afternoon on the Capitol Limited. The Capitol Limited service runs daily between Washington DC and Chicago, following the historic B&O line through the Potomac Valley. Our overnight journey takes us past historic Harpers Ferry and the Allegheny Mountains into Pittsburgh, before crossing into Ohio and heading north to Cleveland, across Indiana and eventually into the center of Chicago. Sit back, relax, and enjoy the passing scenery from the comfort of the Sightseer Lounge before moving to the dining car to enjoy dinner - included as part of the journey. We arrive in Chicago after breakfast on board the Capitol Limited. Here we spend the next two nights at the Cambria Hotel, located within walking distance of Navy Pier, the shops of the Magnificent Mile and the lake. On arrival in Chicago, we board a coach at the station for a city tour that revisits the 'dry and lawless years' of the 1920s and '30s. We take in the site of the St Valentine's Day Massacre as well as Al Capone's headquarters, and some of the city's less infamous landmarks. Your afternoon, and Day 7, is free to explore Chicago. 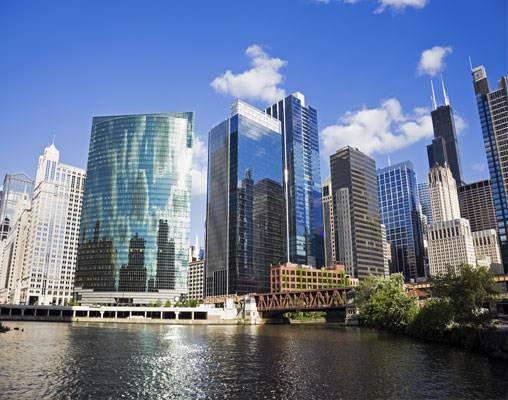 The Willis Tower - Chicago's equivalent of the Empire State Building - is a must-see and offers superb panoramas over the city, the lake and the landscapes beyond. The nearby Hancock Center boasts similarly terrific views. Alternatively, you could venture down to Lake Michigan and enjoy a harbor cruise. After a free morning on Day 8, we board the California Zephyr for an overnight journey to Denver, which takes us across the cornfields and plains of Iowa and Nebraska. The Zephyr has a Sightseer Lounge where you can relax and enjoy the views. Dinner is served in the train's dining car in the evening. 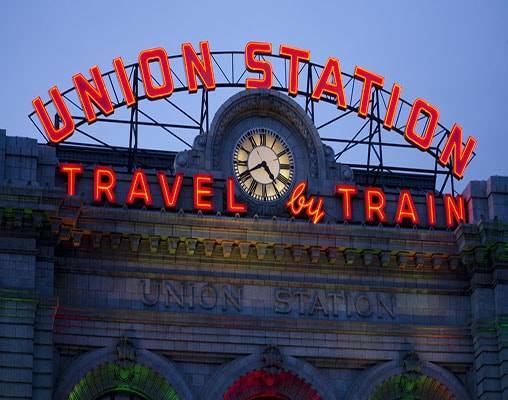 We arrive in Denver (nicknamed the 'Mile High City' as it is at an altitude of exactly one mile above sea level) early this morning, with breakfast served in the dining car. After our guided orientation drive on arrival, the rest of your day is at leisure to explore. Our home in Denver is the modern Magnolia Hotel. 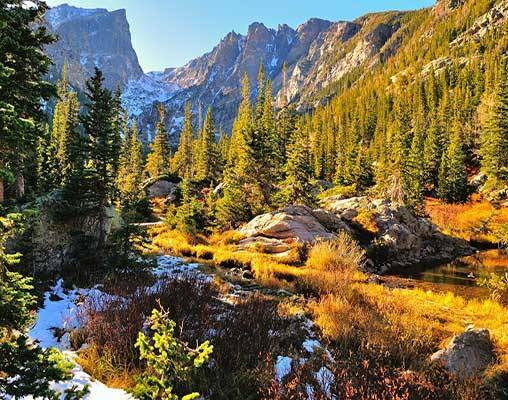 On Day 10 we enjoy a full-day excursion to explore Rocky Mountain National Park and Estes Park. Renowned worldwide for their breathtaking scenery abundant in turquoise rivers, lush forests, majestic mountain vistas and wildlife including elk, bighorn sheep, black bears, coyotes, eagles and hawks, these Parks are the jewel in Colorado's crown. Today we embark on one of the USA's most scenic rail journeys along the route of the Denver and Rio Grande Railroad. Our journey takes us up into the Rocky Mountains, past dramatic peaks and deep ravines to the city of Grand Junction, in the heart of Colorado's wine region, where we enjoy an overnight stay. On Day 12, we transfer to Silverton, for a journey on the Durango & Silverton Railroad, traveling through breathtaking canyons, past emerald-green rivers, across the remote wilderness of the National Forest, to Durango, where we spend the night at the DoubleTree Durango. Today we head along the legendary Route 66 to the town of Williams to join the Grand Canyon Railroad. We travel in vintage carriages, hauled by historic locomotives, to the Grand Canyon to see one of the world's most awe-inspiring sights. The canyon, created by the Colorado River over a period of 6 million years, is 277 miles long, up to 18 miles wide, and a mile deep. We arrive at the South Rim and main viewpoint of the Canyon. This evening we join the Southwest Chief for the overnight journey to Los Angeles. We begin our explorations with a guided tour that includes the magnificent Golden Gate Bridge and the popular Fisherman's Wharf, home to a much-loved population of sea lions. 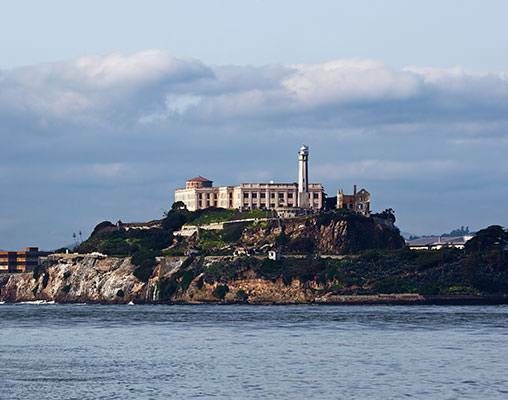 Your afternoon is free to explore further; you may wish to take a ferry across to the infamous prison island of Alcatraz. Located a short walk away from the famous Central Park, and close to iconic Broadway, is our hotel, the 4-Star Le Parker Meridien. 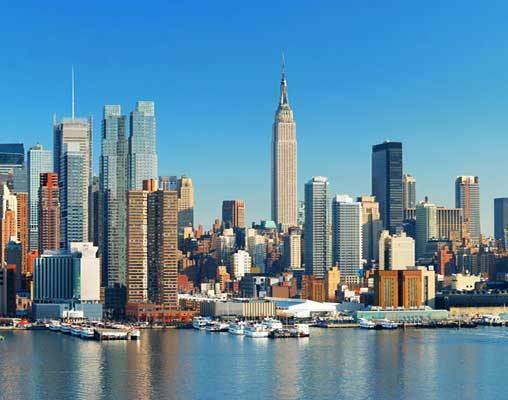 This lovely hotel is surrounded by a plethora of trendy bars and restaurants, and is within reach of many of New York's finest attractions. There are 3 restaurants in the hotel, including one serving delicious burgers, a breakfast bar, an elegant bar set inside an old church, and an Indian restaurant. On top of these fine eateries, there are also many leisure facilities, including a spa, a fitness centre, and a swimming pool, situated at the top of the building with stunning views over Central Park. The rooms are decorated in bright, neutral colours, and come with a hair-dryer, a television, climate control, a mini-bar, and complimentary Wi-Fi. Our base in Washington is the 4-Star Fairfax at Embassy Row, situated close to many of Washington's most famous landmarks, including the Lincoln Memorial and the White House, the home of the President of the United States. This establishment contains a breakfast room, and a restaurant, serving local cuisine, which has been a meeting point for the rich and famous since the 1920's. The rooms are classic and elegant, retaining much of its original charm, and all rooms come with a television, an in-room safe, and complimentary Wi-Fi. Remarkably tasteful, with a rather impressive art-deco façade of white, the 3-Star Magnolia in Denver is an excellent base from which to explore this charming American town. The interiors are modern, and feature all the expected facilities in a contemporary hotel. Amenities here include a well-stocked bar with local beers, a fitness center and a marvellous ballroom. The rooms are well-appointed and well-furnished, boasting complimentary WiFi, a television and tea & coffee making facilities. The DoubleTree By Hilton Hotel in Durango overlooks the scenic Animas River and is within walking distance of the town's shops and restaurants. Facilities include an indoor swimming pool, jacuzzi, fitness center and a restaurant and lounge. Rooms feature a television, air conditioning and hairdryer. The RMS Queen Mary, the former Cunard ocean liner and Second World War troop ship, provides a unique base from which to explore Los Angeles from her moorings in Long Beach. The ship offers numerous on-board restaurants, bars and cafes serving a wide range of cuisine from family-friendly American cuisine to fine dining, Starbucks coffee and pastries to an authentic British afternoon tea. There is a fully-equipped gym open 24 hours a day and a spa offering a range of beauty treatments and therapies (payable locally), plus a selection of on-board boutiques and shops, selling gifts and souvenirs, couture clothing, ocean liner memorabilia and day to day essentials. Much - but not all - of the accommodation on board is in the original First Class Staterooms. All Staterooms are individually decorated with a blend of tradition and old-world elegance and the best in modern amenities, and come with an LCD flat screen satellite television, a hairdryer and WiFi internet access. A mini fridge is available upon request and a laundry service is available. The Capitol Limited takes us 764 miles (1,230km) from Washington, DC to Chicago. We begin at Washington's beautifully restored Union Station and as you leave the city you catch glimpses of landmarks such as the blue and gold dome of the largest Catholic cathedral in the US. The train soon enters the state of Maryland and you begin our climb through the Appalachians, which offers us wonderful views of the Allegheny Mountains along the way. The California Zephyr runs from Chicago in the east to Emeryville, California in the west. During our overnight sleeper journey on the California Zephyr as part of our USA Coast to Coast holiday, you travel on just a section of this route - from Chicago to the 'mile high' city of Denver, a 17 hour 1,038 mile (1670 km) trip. The Southwest Chief stretches 2,256 miles (3,631km) from Chicago to Los Angeles, taking passengers on a historic route well-trodden by American Indians, Spanish conquistadors and fur trappers. The Coast Starlight runs on the 1,390-mile (2,237km) route from Los Angeles to Seattle, taking its passengers along the shores of the Pacific Ocean, through lush, green valleys and impressive mountain ranges. On our USA Coast to Coast holiday you travel just a short section of this journey from Los Angeles to San Francisco. 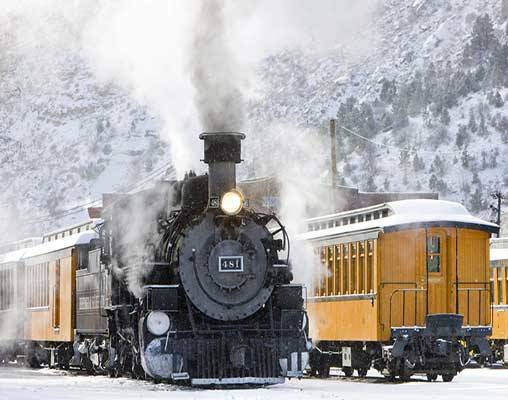 The Durango & Silverton Railroad has been in continuous operation since 1882 - now 136 years ago. It still operates steam engines and vintage rolling stock, and, perhaps most impressively, they are all indigenous to the line. The locomotives in use today made their first appearance there between 1923 and 1925. The line climbs from Durango into the San Juan Mountains at Silverton, on a journey lasting 3 ½ hours. This allows plenty of time to enjoy the magnificent scenery. Opened in 1901, the Grand Canyon Railroad carried passengers and supplies over the sixty-five mile journey from the Arizona town of Williams to Grand Canyon Village at the canyon's South Rim. A convenient means of visiting one of the USA's greatest natural phenomena, the Grand Canyon Railroad remained popular with tourists until the irresistible rise of America's car industry. As the popularity of road travel boomed, the railroad's passengers declined and the line became freight-only in 1968 before closing altogether in 1974. Realising that such an iconic line could not be lost, entrepreneurs Max and Thelma Biegert bought the Grand Canyon Railroad in 1989, just as its rusting assets were being salvaged for scrap. Its track and rolling stock lovingly restored to its original glory, the railroad re-opened in 1990. Today, although the magnificent steam locomotives that once hauled carriages to and from the Grand Canyon only appear very rarely, the two-hours and fifteen-minute trip to and from Williams remains an unforgettable and nostalgic journey through one of the USA's most spectacular landscapes. Enter your details below if you would like to be notified when 2020 dates and prices are available for USA Coast to Coast.